In the 1950s and 1960s, the recording of live transmissions was largely accomplished via the telerecording process, resulting in a continuous record of the broadcast on film. It has usually been assumed that this film recording was then left untouched, and only over recent years has it become clear that this was not necessarily the case. In some instances, once the live transmission of a drama had concluded, the cast and crew remained in the studio and re-performed sections of the programme that were considered to have been substandard on broadcast. These scenes were also telerecorded and could subsequently be edited into the master recording to create a more polished version of the whole programme. The earliest verified example of the practice (which I’ll simply call ‘re-recording’ here for convenience) occurs in the mid-1950s and I suspect it is not coincidental that it was around this point that the technical quality of telerecordings reached a level that made them acceptable for broadcast, opening up opportunities for domestic repeats and foreign sales of programmes. Improving the quality of a programme for an anticipated repeat or overseas broadcast would seem to be the obvious reason for re-recording, although there is insufficient evidence to say whether this was the only, or indeed primary, reason that it was done. In the absence of any structured research in the area it is impossible to say how regularly re-recording occurred but the limited evidence currently available gives reason to suspect it was relatively frequent. The career of BBC producer/director Rudolph Cartier is probably the most researched of any practitioner of live television drama and this research has brought at least two examples of re-recording to light. Cartier is famous for, amongst other things, the three Quatermass science-fiction thriller serials of the 1950s and he is known to have practised re-recording on the second and third of these.1 According to Andrew Pixley’s exhaustive booklet from the Quatermass Collection DVD, internal BBC correspondence confirms Cartier’s intention to re-record sequences of Quatermass II after transmission and have these edited into the master recording in time for the scheduled weekly repeat the Monday after each Saturday’s episode.2 It’s not clear how many sequences Cartier chose to re-record and he had been cautioned to keep these to a minimum by the BBC’s Telerecording Manager as time constraints for the editing to meet the repeat slot were very tight. Indeed, Cartier was advised that if more than two sequences were to be re-recorded, it would be more cost-effective to re-perform the whole episode for a new recording, although it seems unlikely that this would have been feasible either. In the cases of the Quatermass serials the reason for the re-recording seems obviously related to repeats, planned or potential. 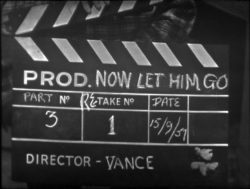 However, a similar letter to the one mentioned above confirms that re-recording was also practised by producer/director Tony Richardson on the 15-minute drama The Birthday Present, from July 1955, which, presumably, had much less potential for repeat or overseas sales.5 The idea that re-recording was at least a fairly common occurrence is reinforced by the fact that the letters I refer to were both derived from a pro-forma template, indicating they were likely issued by the BBC in considerable numbers. It is also surprising to see that the whole original recording was retained, fluffed dialogue and all, with the re-recorded scenes being retained separately. Perhaps the new footage was never edited into the recording if a planned repeat or foreign sale fell through. Equally, another print may have existed which did include this new footage. This evidence begs the questions of how common re-recording was on Armchair Theatre – a significant programme in the development of television drama, making its surviving recordings of particular interest – and whether any of the other surviving telerecordings of its live instalments include re-recorded sequences. Live transmission for drama was largely phased out during the early 1960s but some examples did continue late into the decade, notably on the BBC’s Z Cars as a result of producer David E Rose’s advocacy of the method. David Brunt, who has researched the series extensively while compiling The Z Cars Casebook, advises that re-recording was practised at least semi-regularly.8 Brunt reports that some intriguing evidence of the differences between transmissions and final master recordings can be seen thanks to ‘tele-snaps’ (off-air stills taken from a television screen during transmission by photographer John Cura). During the series’ 100th episode, Rose, directing, concealed cameras behind doors on a corridor set.9 His direction proved somewhat over-ambitious, with the apparently hidden cameras being visible on screen, as shown by the tele-snaps. However, the master telerecording which has been retained by the BBC features the same scene without showing the offending cameras, clearly indicating it had subsequently been re-recorded.10 Without such tell-tale evidence as this it is impossible to know for sure how regularly re-recording was practised and how many sequences in any programme may have been re-recorded and replaced. I would welcome any more examples or evidence of the practice that anyone may be able to share. It should also be noted that when it comes to the question of the fidelity of archive recordings to original transmissions, it is not only live dramas which are affected. Any programme, whether live or pre-recorded on videotape, which has been retained as a telerecording will display reduced picture definition and motion from the original and may also feature numerous other defects, such as geometric picture distortion and sound distortion, plus all the various blemishes (dirt, scratches, etc) that may befall film prints. The process of telerecording may also change shot framing as a result of the zooming-in on the picture required to ensure the edges of the telerecording monitor remain out of shot, causing varying degrees of peripheral picture loss. Amongst viewers without a specialist interest in the area, archive television (particularly when monochrome) is widely thought to be of poor technical quality, which is an erroneous assumption based on surviving telerecordings which commonly suffer from all or some of these defects, resulting in a notably inferior picture and (often) sound quality than on the programmes’ original broadcasts. I can’t draw any satisfying conclusions from my brief survey of the evidence of re-recording, but it does show that we cannot be confident when watching a recording of a live drama that what we are seeing is what the original audience saw on that live transmission, meaning we may need to be more open-minded when considering the aesthetics and technical quality of live television drama. Equally, without some background knowledge of the processes involved in the preservation of both live and non-live drama from the earlier decades of television, it is equally hard to be certain of the level of fidelity to the original broadcast of any given recording. With thanks to David Brunt and the BBC Written Archive Centre. Originally posted: 1 January 2018.